TC5970D RF Shield box by Concentric Technology Solutions, Inc. Outer Dimension: 660(W) x 660(D) x 531(H)mm , lid closed. 890(H)mm, lid open. *Effectiveness measured with M5970D01A I/O module. See datasheet for ranges with other standard module configurations. TC-5970D RF Shield Box provides both high RF isolation and room for testing medium to large size wireless device testing. 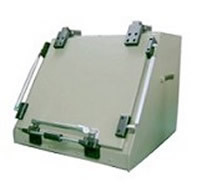 TC-5970D RF Shield Box is an ideal test platform for Engineering, Manufacturing, or service due to it's ergonomic design.